Free trade creates both winners and losers in the battle for markets and economic advantage. 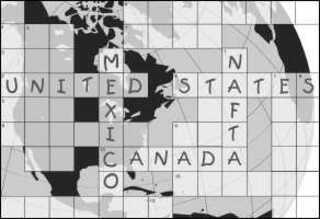 Those who led the debate in favor of NAFTA were people who believe more winners are created by removing barriers to, and lifting restrictions on, the free exchange of goods. After five years, has NAFTA's trade liberalization created more economic winners than losers in Michigan? In considering this question, this section incorporates anecdotal examples of companies claiming injury as well as those claiming benefits from NAFTA. The economies of American states have become increasingly global, and many states now look to their export industries to help ease economic downturns.18 Perhaps no state's economy has been more closely tied to foreign markets than that of Michigan, which leads the nation in exports to Canada and is the third-largest state exporter to Mexico. Foreign trade made up 15 percent of Michigan's gross state product in 1996. The importance of the NAFTA nations to Michigan is amplified even more by the fact that approximately 70 percent of the state's foreign trade is with Canada and Mexico. Michigan's reliance on the trade of NAFTA nations has been remarkably consistent, constituting between 69 percent and 73 percent of exports since the mid-1990s.19 In other words, Michigan depends on the NAFTA nations for a large portion of its economic health. Companies and union and nonunion employee groups that believe they have been hurt by NAFTA can petition the U. S. Department of Labor for compensation. This compensation, known as NAFTA Trade Adjustment Assistance (TAA), covers workers laid off as a result of heightened imports from Mexico or Canada, or because of a shift of production to those countries. Both NAFTA TAA and regular TAA (started through the Trade Act of 1974) entitle a laid-off worker to 52 weeks of additional unemployment compensation beyond the usual 26 weeks offered. Thus, a worker certified by the Department of Labor as being injured by NAFTA can receive up to 1.5 years of unemployment benefits. The first 26 weeks of standard unemployment compensation are provided by the state, whereas all NAFTA TAA and regular TAA are funded by the federal government. NAFTA TAA covers not only workers hurt by heightened imports due to NAFTA or a shift in production to Mexico and Canada, but covers workers whose jobs are indirectly affected by NAFTA or by "foreign competition." For instance, TAA provides benefits to workers who lose jobs at a company that does business with a company that trades with Mexico or Canada. In other words, it makes sense for many individuals and companies to claim harm as a result of NAFTA because the government gives them an economic incentive to do so. While no one denies that increased competition makes it tougher on companies that are not prepared to meet the challenge, one also must be somewhat skeptical about company claims of injury by NAFTA, regardless of whether they are "certified" by government sources. Most of those "certified" as hurt by NAFTA, like Reidbord, are losing out to the more competitive wages that have existed in Mexico for generations. The lower wages would have existed regardless of NAFTA. In many cases, the pre-NAFTA tariff levels would not have been high enough to offset Mexico's much lower wages. According to the U. S. Department of Labor, Mexico's wages are eight times lower than U. S. wages. Given that reality, a U. S. tariff would have to be extraordinarily high to offset the wage difference. Still, there are other factors that go into economic development in the Americas including location, cost of transportation, and education level of the labor pool. Another Michigan company, Peregrine Incorporated, received NAFTA TAA certification for two of its Michigan plants after filing on February 22, 1999. Peregrine Incorporated manufactures interior and exterior automotive components for car companies. Both the Flint stamping and assembly facility and the Livonia door-trim plant were approved, deemed injured by Canadian competition. Yet, the company had announced the plant closings a year prior to filing for TAA. A July 7, 1998, company press release states that both plants would be closed as part of a "turnaround plan." The press release mentions nothing about NAFTA competition, but explains that the plants were "unprofitable" and would "require enormous capital investments in dies and presses as well as infrastructure improvements." According to the press release, this was due to "outmoded facilities and expensive, inefficient processes. "25 Again, external competition from Canadian companies was not mentioned, contrary to the TAA certification. According to Public Citizen, a nonprofit group founded by activist Ralph Nader, 57 percent of NAFTA TAA petitions are approved nationwide. The following lists some notable Michigan TAA approvals. Unfortunately, there is no way to confirm whether all of these were truly due to NAFTA. In the first successful NAFTA TAA petition, 35 workers at First Inertia Switch in Grand Blanc were certified in July 1994. The company's accelerometer business was allegedly hurt by increased customer imports from Mexico. Reef Gear Manufacturing, Inc., in Marine City produced transmission gears for golf carts. In December 1997, 143 workers were certified as being hurt by increased company imports from Canada. Visy Paper, in a petition filed by a labor union, was certified for 122 workers. The Menominee plant, which produced linerboard and tubestock paper, claimed injury by increased customer imports from both Mexico and Canada. Workers at Breed Technologies' St. Clair Shores plant filed a successful petition, granted in March 1998, for 429 employees. The company, which builds seat-belt assemblies, reported it was hurt by a shift in production to Mexico. The United Auto Workers union at Walbro in Cass City filed a successful NAFTA TAA petition in August 1998. The union said the company's production of small-engine carburetors had been hurt due to a shift in production to Mexico, costing 138 jobs. Borg Warner's Sterling Heights automatic transmission plant petitioned in August 1998 as well. Again, a shift in production to Mexico was alleged to affect 259 jobs. Indiana Knitwear was certified in May 1999 for 31 workers at their Colon plant. The maker of knit sportswear was supposedly hurt by a shift in production to Mexico. Overall job losses are difficult to estimate. It is clear, however, that NAFTA has not caused a massive job drain and certainly has not produced an overall decrease in employment across the state. Indeed, exorbitant job loss claims are also refuted by statewide unemployment statistics. Since the initiation of NAFTA, unemployment rates have dropped every year. We do not propose this as evidence for NAFTA's success, as falling unemployment is characteristic of the broader economic expansion. Nonetheless, the numbers are useful in rebutting the assertion that NAFTA has led to a huge decline in Michigan jobs. Clearly this is not the case: Employment has grown in Michigan during the NAFTA years (see Chart 2, below). Also, as noted in the next section, employment in the auto industry—a substantial component of Michigan's jobs—increased by 110,000 between 1993 and 1996.